When I was in seventh grade, our class went on a marine biology trip for a week in Mendocino and the thing I remember most about the whole trip was playing on the sand dunes. Then a couple years ago, my daughter Natalie went on the same trip and she loved the dunes too. 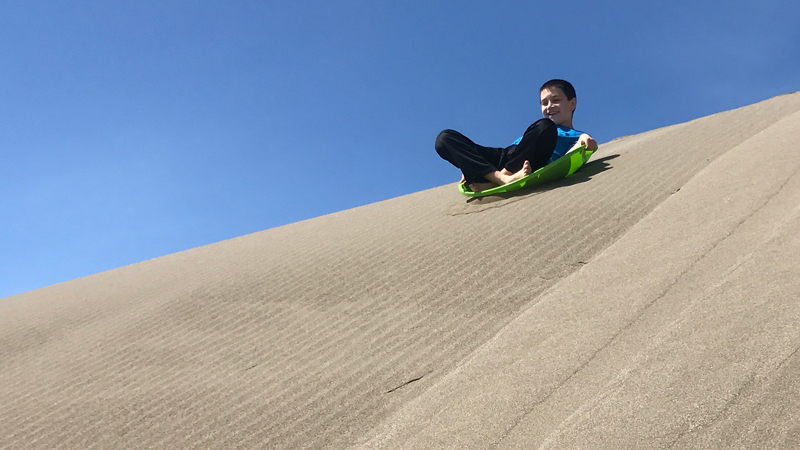 So naturally, when planning our spring break trip to Mendocino and Fort Bragg, we wanted to take my husband Brian and son Carter to the dunes — and we brought our snow discs to go sand sledding! The Mendocino sand dunes are part of the 1,300 acre Inglenook Fen—Ten Mile Dunes Natural Preserve that forms the northern section of MacKerricher State Park. Ten Mile Dunes Natural Preserve, stretching from Ward Avenue north to the Ten Mile River, contains a unique, native dune and wetland ecosystem. It includes the Inglenook Fen, Ten Mile River, Ten Mile Beach, and the Ten Mile Dunes. The Inglenook Fen is an area of the Preserve that is midway between a marsh and a bog. It is the only known remaining coastal fen in California and home to a rich variety of plants and animals. Ten Mile Beach, which is really only about four miles long, is technically a series of beaches backed by one of the northern California coast’s longest dune systems. More than 90 species of birds visit or live on the sand and along the cliffs. Seals lounge on nearby rocks, while whales feed and play year-round. At the widest point, The Ten Mile Dunes extend three-quarters of a mile from the beach to Highway 1. With sandy dunes reaching up to 130 feet tall, this is California’s most pristine stretch of coastal dunes. To reach the Ten Mile Dunes, we traveled north on Highway 1 past the entrance to MacKerricker State Park and past the towns of Cleone and Inglenook, to a large pullout on left side of road. At the northern end of the pullout, there is a small brown trail marker and a narrow trail to the dunes. None of us had ever tried sand sledding before and with our plastic snow discs in hand, we couldn’t wait to try it. We followed the trail and in less than a minute were standing on soft, warm sand that stretched out in front of us all the way to ocean. The massive sand dune complex was incredible and anxious to have some sledding fun, we set out to find some big dunes. Walking across the soft, powdery sand is not as easy as you’d think! We all quickly took off our flip flops to traverse the dunes barefoot and as soon as we reached the first dune, Carter was off and running to the top as fast as he could go! He was the first one to sled down the dunes and the giant smile that stretched across his face had Natalie racing her way to the top of the dune too. After several runs down the first dune, we set out in search of even bigger dunes and we all took turns sledding down the steep sandy hills. Even Brian and I did it and it was totally fun! While Brian, Natalie, and I eventually got tired from climbing up the dunes over and over, Carter never got tired. He just kept going, over and over and we all relaxed on the warm sand watching him. Then he asked, “Do I have to use the sled?” And, remember how much fun I had rolling down the dunes with my friends when I was younger, of course I said no! That sent both Carter and Natalie back up the dunes to run and leap off the tops, flying through the air and crashing into the soft sand over and over until they just laid in the sand exhausted. Jumping, leaping, rolling, and sledding down the sand dunes was an unforgettable experience and easily one of the best parts of our entire trip! At this point we were already covered in sand, so we took the opportunity to wrap up our day building sand castles at Pudding Creek Beach. Ten Mile Beach is located at 25301 Ward Avenue, Fort Bragg, California 95437 in the Inglenook Fen — Ten Mile Dunes Preserve at MacKerricher State Park in Mendocino County. Download the MacKerricher State Park brochure. At the south end of the beach, there is a parking lot on Ward Avenue and at the north end of the beach, there is a parking lot just off Highway 1 at Ten Mile River Bridge. Our destination for this adventure wasn’t the beach, it was the sand dunes, so we simply parked in a wide pullout alongside Highway 1 next to the dunes — look for a small brown trail marker and narrow trail. Wear flip flops if you can, that way you can easily take off your shoes and walk barefoot across the dunes. It is so much easier barefoot. Bring water and wear a hat or sunscreen. Consider bringing plastic snow discs with you so you can climb to the top of the dunes and sled down them! No dogs are allowed on the beach or in the sand dunes complex. PLEASE NOTE: If visiting the dunes, avoid any areas of habitation and wetlands, and do not disturb plants, small ponds, or any other signs of life. If you want to go sand sledding at the dunes, enter the dunes from alongside Highway 1 and stay among the pure sand dunes.